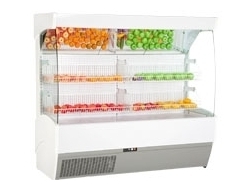 Displaying your fruit and vegetables has never been easier with our Multideck chillers. Optimal lighting and angled mirror ensures your food is displayed correctly while keeping things fresh. So don’t go bananas pick up one of our units now. If you are unsure of which multideck you need, then contact one of our talented team who will only be too happy to help. We have a live chat feature or you can call us at 0115 9413640.